To know a lot about this particular set of Newark homes, you either have to be very old or have spent a great deal of time scanning local newspapers, for not a single one is standing and only a few of us can actually remember seeing any of them while they were an important part of the Newark landscape. Cockloft Hall, the great summer home of the Kemble family that was visited by Washington Irving, was built about 1800 on the banks of the then-pristine Passaic. Irving visited his friend Gouverneur Kemble on many occasions in the last century's first decade, and it was there that he wrote the famous 'Salmagundi Tales,' weaving fact and fiction into a story that forever captured the city's nearly lost past. Irving spent large portions of his summers at the mansion with the 'Lads of Kilkenny,' who also included William Irving, James Kirke Paulding, Henry Ogden and Henry Brevoort Jr. Noted one historian: 'What rollicking times they all had in the big hall, and on the lawn that sloped right down to the river in those days, with the broad, untrammeled fields of Bergen county making a pleasant prospect just across the river (at that time Hudson was still a part of Bergen County).' The house, Cockloft Hall, was about a mile from downtown Newark and was in the middle of 24 acres with the Passaic River at its front door. A honeysuckled porch, with permanent seats on each side of it, was most welcoming to visitors. The exterior was a large plain square frame building with a hipped roof and attached wings on either side. The front door opened into a hall of 'The Chinese Saloon.' Instead of extending lengthwise, it ran crosswise, and occupied the entire front of the main body of the house. At one end was a dining room, and at the other a drawing room. A staircase led to a second floor that gave way to four bed chambers. In the Red Silk chamber a giant four-postered bed was covered with a silk tester and a superb cabinet of applewood and brass dominated the room. The sleeping floor also boasted of Green, Pink and Blue Chintz chambers. Outside the house there was a rock-surrounded pool for storage of fresh fish, a large cherry tree and a winding path by which travelers approached the house by foot or horse. By 1824 the house passed from the Kemble family to a succession of owners. It was substantially altered each time. Its summer house was destroyed with the completion of a Civil War-era street, the rock pond was drained, and the Passaic became a less attractive river. The famous visitors no longer called at the mansion, but Irving's stories had immortalized the place. So why not spend an hour or so with the 'Salmagundi Tales' some evening—there's part of Newark to be found there, too. The Turnbull estate in Forest Hill was replaced in the 1960s following the death of the mansion's last owner and after a brief period in use as a nursing home. Built in 1850 by Adam Scharaff, a New York City banker and merchant, it originally extended from the Passaic River to today's Branch Brook Park. Later, the Turnbulls escaped from the summer heat of New York City. It was where Miss Mary E. Turnbull lived until her death at age 99 in 1952. The Turnbull family fortune was built on the manufacture of Newark carriages on Edison Place. Like so many other 19th century Newarkers, they were from Scotland and actually knew Sir Walter Scott. Here in Newark they soon earned a reputation for specializing in the building of hearses and funeral coaches purchased by customers around the country. Late in life Miss Mary reminisced about the 'early days when a horse-car ran from Bloomfield to Arlington avenues and where the woods began.' In this era, Turnbull friends and neighbors included the Ballantines, Hellers and Clarks. Their mansion was four stories. The downstairs interior was paneled with fine teak and a porte-cochere protected visitors and family alike from unkind weather. Fireplaces were in every room, and an elevator was useful as well as a residential curiosity. Anybody over 45 living in Newark who knows the Roseville area of the city might remember the Peck house. It was built in 1854 by one of Newark's richest families, one that traced its ancestry back to the early 18th century and made its fortunes as presidents and officers of the Sussex Railroad and later the Delaware Lackawanna and Erie line. Cyrus Peck, son of Aaron, the home's builder, was a banker and insurance executive and was one of the founders of the Essex County Park system. He gave a good portion of the land for Branch Brook Park. He occupied the 12-room farmhouse for most of his life. The last of the Pecks was Edith, who left the house and a bequest for $250,000 to the Roseville Presbyterian Church with the hope that the yellow- and-white farmhouse with its black shutters would survive as an oasis in a sea of city cement.' This was not to happen. First the Victorian carriage house was demolished, and later the house was to fall to 'progress.' No longer was it deemed practical to use the Victorian structure that was once caressed by 'rambling roses, beds of tulips and the spring daffodil.' Sentiment was replaced by utility. The Albright mansion at High and Spruce streets has been preserved for us by local artist C. Durand Chapman in his painting of Christmas time along High Street. Truly one of Newark's greatest houses, it was built entirely of imported marble and granite in the 1870s for Inslee Hopper at a cost of nearly $500,000. Hopper was vice president of the Singer Sewing Machine Co. Stone, tiles and mosaics from all over the world were used in the house's construction, but the predominance of the green marble from Italy earned for it the nickname the 'Green Castle.' Andrew Albright Sr. purchased the mansion in 1879. He made his fortune manufacturing rubber-covered harnesses and rubberset brushes. Many social galas were held there, and Andrew Sr. became a Republican candidate for governor. The house remained in the Albright family until 1919 and was demolished during the march of the three- and four-story apartment houses along the one-time socially elite High Street. The building's proportions were similar to the Krueger-Scott mansion, but somewhat more massive. It occupied a corner lot and was a collection of multi-story heavy stone with a four-story square tower anchoring the central part of the structure. Its Norman-Victorian roof-line was pierced by a variety of chimneys, gables, cornices and elaborate windows. It was impressive. 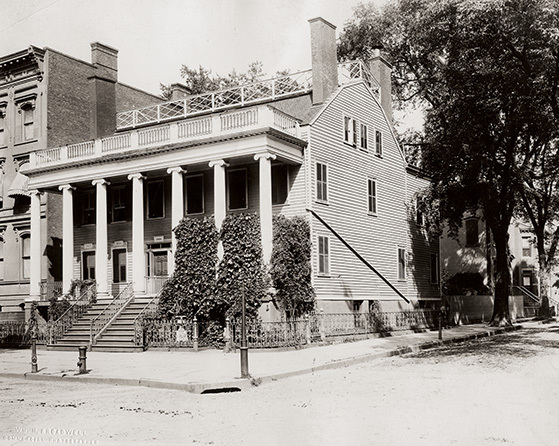 The Kinney house at 1026 Broad St. was one of Newark's finest Georgian mansions—a building that demanded respect from its viewers. It was a three-story brick edifice with a formal centrally located entrance. There was a bay window over the front door, and five windows on both the second and third stories. Two windows flanked each side of the main door. There were dormer windows on the fourth floor, and two adjoining architecturally complimentary side buildings. The formality of the house was not unlike many of the great mansions in Boston and New York. The family that built the house was descended from Sir Thomas Kinney. Kinney came to America in search of copper deposits in Sussex and Morris counties before the Revolution, but later supported the colonies and renounced his allegiance to the crown. His grandson, William B. Kinney, built the house at 1026 Broad St. and helped establish the Newark Sentinel of Freedom and the Newark Daily Advertiser. Have you made the connection with East and West Kinney streets yet? In 1916 the building was demolished and the property passed into the hands of the Newark Committee of One Hundred for the purpose of construction of the elusive Newark Memorial Building. The Shanley mansions in Washington Street were located at Nos. 82 and 86 across the street from St. Patrick's Cathedral. Built in the 19th century, the elegant houses were the home of Bernard M. and Julia Hyde Shanley until 1900 when Mr. Shanley died. Mrs. Shanley lived there until she passed away in 1906. While smaller than some of the city's mansions, they 'were certainly among the most elegant. Their scarlet and gold damask walls, gold leaf and onyx fireplaces bore the family monogram. The glass-paneled double doors led from the street to a reception room that opened onto high-ceilinged living, music, drawing and dining rooms. The solid black walnut carved staircase led to the top of the three-story house, and was decorated with an expensive tapestry. The second-floor bed chambers were decorated in palace pink, green and cream damask, and the master bathroom had a legendary gold-plated shower with side sprays set waist-high along the water tubes. The $7 million Shanley fortune (that's in 1900 dollars) made it possible for Mrs. Shanley to live anywhere she wanted. Subsequently, she elected to move to East Orange's Munn Avenue. In their last years the mansions became an emergency home for women and children for the Salvation Army's Northern New Jersey district. All embellishments were removed. Today, the site is a parking lot. The third group of 19th century mansions to be demolished in the '30s were the brownstones along the south side of Washington Place. In February 1931 the Scudder, Orton and Smith houses disappeared after briefly serving as the Park Square Hotel. No.10 was an early home of Wallace Scudder, publisher of the Newark News. No. 12 was home of James Orton, and No.14 was home of former U.S. Sen. James Smith Jr. With the elimination of this block of important Newark townhouses, the elegance of Washington Park and Newark began changing. Another lost Newark landmark was the old Marcus L. Ward mansion on the present site of the Newark Museum on Washington Street overlooking the park. There is no agreed date for its construction, but one museum publication places it in the 1780s or 1790s. We know that it was demolished in 1924 to clear a site for the central building of the museum. Nor are we certain who built the structure, but we know that at one time it was occupied by James Robinson, a pretentious Newark shoe maker. It is assumed that he sold it to the Wards. In 1872 President Ulysses S. Grant, staying here on his visit to take part in Newark's 1872 Industrial Exposition, said that the city 'had raised itself to a most important position in (national) industry and trade.' In 1922 the city bought the historical old structure, and in spite of protests from many prominent citizens, including John Cotton Dana, razed the property, thus creating a whole new era on the park, and at the same time encouraging the beginning of a cultural spirit of the city. The mansion was essentially a four-story square-frame structure. Its first floor was an above-ground red brick basement, and a four-column porch stretched halfway across the second floor that included the door. A row of shuttered windows stretched across the third level, and an abbreviated Chippendale-designed balustrade surrounded the two fourth floor dormer windows. Four square flanking chimneys were both utilitarian and decorative. The front of the house was protected by a low stone wall and decorative metal fence. Broad Street has always been Newark's most important street and change has always been constant. By the 1890s the southern end of the thoroughfare was reported to be 'still dotted with fine homes and residences of some of the more distinguished families in Newark.' But passing time eventually created a pattern of change in the neighborhood. With the development of the city as a commercial center, homes began to give way to stores. A good example of this change occurred at 986 Broad St., the home of Dr. George O'Gorman, one of the nation's first supporters of the ideas of 19th century French scientist, Louis Pasteur. Dr. O'Gorman's house, on a 30- by 259-foot lot, was purchased from Andrew Hedger in 1890 for $8,700. The three-story tiled roof residence measured 30- by 40-feet. Attached to it was a 15- by 28-foot stable and carriage house. O'Gorman maintained his office in the building. Later, the Hydriatric Institute operated there. After the doctor's death the house also was used for various businesses, including a cleaner, a barber, office supply firm, chiropodist, hairdresser, dress shop and a tavern. Other businesses continued to operate from the building after the death of Mrs. O'Gorman, but gradually they too disappeared. By 1947 the building was listed as 'vacant' and was used only for storing window decorations. By the end of 1947 it was simply listed as 'beyond repair' and was demolished. One by one the homes of the great and near-great were beginning to vanish on old South Broad Street.